Thanks so much to the publisher for sending me a galley and press about this upcoming novel. 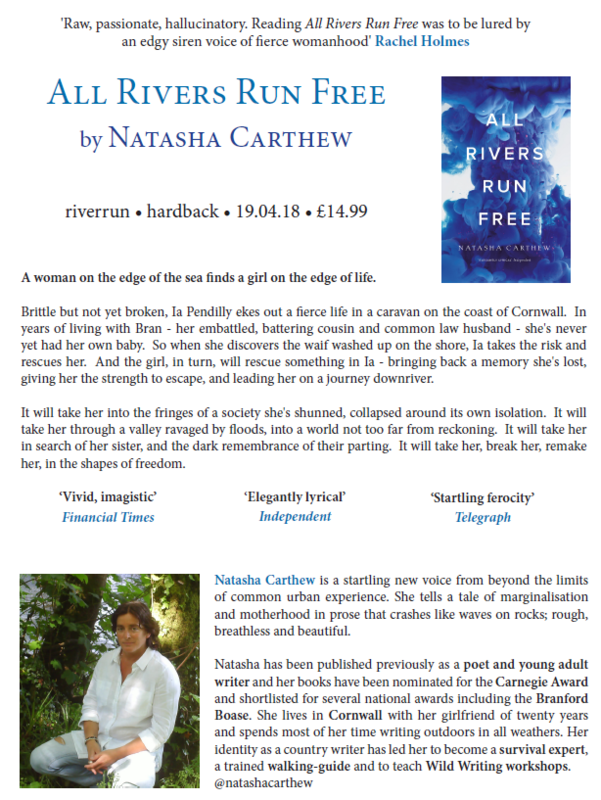 All Rivers Run Free is a lyrical novel about marginalisation, mental illness and motherhood set on the ravaged, near-future coast of Cornwall. It’s a world collapsing under flooding and social breakdown, with military on the streets. But we don’t see what’s caused all this. Our heroine, Ia, doesn’t have a mobile phone or access to the internet. She doesn’t have a job, or social support, and she gets her antidepressants from the alley behind the surgery. She’s uneducated, stubborn, scared and loveable, and to me, completely real. It begins with her latest miscarriage, and ends with her finding hope. The voice in All Rivers Run Free is fierce, startling and original, and it hit me on every page. It’s a breath-taking novel that plays with prose and brings a savage nature into the characters’ lives. I don’t doubt this novel is coming at the right time for an audience who will fall in love like we at riverrun did. Like Megan Hunter’s The End We Start From, it imagines what family looks like in a world breaking apart; like Evie Wyld’s All The Birds, Singing, it tracks the journey of a woman from desperation to hope in a rural wilderness; like Sara Baume’s Spill Simmer Falter Wither, it gives a voice to often invisible or ignored people; like Eimear McBride’s A Girl is a Half-Formed Thing, it realises the mental anguish of a young woman in flayed, fearless prose. With this eye-catching cover, gorgeous finishes and a map, we’re going to make the outside as beautiful as the inside.